Filler Powder Capsules are machines designed to fill powders, pellets, or liquids into a capsule. Semi-automatic capsule powder filler machines will only fill the capsule and require an operation to cap the capsule, while an automatic capsule powder fillers will fill and cap the capsule automatically. Elanco, Model 8S, semi-automatic, stainless steel powder / pellet capsule filler rated from 4,500 to 33,000 capsules per hour – depending on materials, application, capsule size and operator dexterity. Capsule size range: 000 to 5 with proper change parts. Equipped with 7" long x 7" wide x 6" deep empty capsule hopper, slide gate and vacuum rectifier raceway, product ring with clockwise rotation indexing and 9" diameter x 12" deep powder / pellet product hopper with agitation and pneumatic capsule compression closing ring with discharge chute and self contained vacuum system with start / stop push button controls. Mounted on stainless steel base frame with leveling legs. Automatic Stainless Steel Pellet Filling System Is Capable Of Up To 1,000 Capsules Per Minute. Capsule Size Range 0 – 4 And Is Currently Set For Size 0. Filling Accuracies Within +/- 2%. Filler Is Totally Self Contained With A Main Drive And Vacuum Pump. Designed With An In Pellet Recovery System. Three Pulley Drive Can Produce Three Fixed Output Speeds. Unit Was Last Used In A Pharmacuetical Operation. Capsugel Model Ultra 8, semi automatic, stainless steel, powder or pellet capsule filler rated from 4,500 to 33,000 capsules per hour – depending on materials, application and operator dexterity. Capable of handling capsule sizes: 00, 0 and 1 thru 5 with proper change parts. Equipped with fill ring holder, capsule hopper, slide gate magazine, vacuum rectifier head, clockwise rotation indexing ring, index brake, product hopper, self-contained horizontal hydraulic closing system, oil-less vacuum pump. Control panel has rotary table, vacuum and hydraulic pump, hopper auger start push buttons with main machine power switch and power supply ammeter. Mounted on stainless base frame with height adjustable legs. Requires appropriate change parts per size changes. Compact, intermittent motion, single dose capsule filler, rated up to 40,000 capsules per hour – depending on materials and application. Capable of handling capsule sizes: 00, 0, 1, 2, 3, 4 and 5 with powders, granules and pellets, as well as tablets (with proper change parts). Vertical movement, vacuum dosators and limited change parts for fast change-over. Capsule Tech Inc integrated controller and safety guarding. Capsugel, Model 8, semi-automatic, stainless steel capsule filler, rated from 4,500 to 33,000 capsules per hour – depending on materials, application, capsule size and operator dexterity. Capsule size range: 00 to 5 with proper change parts. 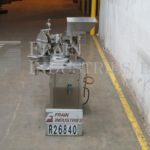 Equipped with 18" wide x 20" long x 10" deep capsule hopper, empty capsule magazine, capsule slide and vacuum rectifier raceway, with 1-3/4" vacuum connection hose. Product ring with clockwise rotation indexing. 7"diameter x 10" deep product hopper with agitation and pneumatic capsule closing assembly with push button control, Eriez Hi-Vi, 3¼" wide x 16" long vibratory discharge conveyor and start / stop push button controls. Mounted on stainless steel base frame. Capsugel, Model 8, semi-automatic, stainless steel capsule filler. rated from 4,500 to 33,000 capsules per hour – depending on materials, application, capsule size and operator dexterity. Capsule size range: 00 to 5 with proper change parts. Equipped with 186" wide x 20" long x 8" deep capsule hopper, empty capsule magazine, capsule slide and vacuum rectifier raceway, with 1" vacuum connection hose. Product ring with clockwise rotation indexing. 7" diameter x 10" deep product hopper with agitation and pneumatic capsule closing assembly with push button control, 3" wide x 16" long vibratory discharge conveyor and start / stop push button controls and vacuum pump system. Mounted on stainless steel base frame. Zanasi, Model 40F, automatic capsule filler. Rated from 5,000 to 40,000 capsules per hour – depending on materials, application and size capsule. Stainless steel construction. Capsule size range: 000 to 5, supro A-E, DB, DBAA (with proper change parts). Equipped with 8 station rotary table that cycles 6 capsules at a time, empty capsule hopper, product hopper, 20" long x 4" wide discharge chute. Control panel with programmable controller. Mounted on a stainless steel base with guarding. Capsugel, Model 8, semi-automatic, stainless steel capsule filler, rated from 4,500 to 33,000 capsules per hour – depending on materials, application, capsule size and operator dexterity. Capsule size range: 000 to 5 with proper change parts. Equipped with 18" wide x 20" long x 10" deep capsule hopper, empty capsule magazine, capsule slide and vacuum rectifier raceway, with 1-3/4" vacuum connection hose. Product ring with clockwise rotation indexing. 7"diameter x 10" deep product hopper with agitation and pneumatic capsule closing assembly with push button control, Eriez Hi-Vi, 3¼" wide x 16" long vibratory discharge conveyor and start / stop push button controls. Mounted on stainless steel base frame. Semi-auto powder capsule filler rated 4,500 to 33,000 capsules per hour – depend ing on size capsule and application. Machine can be used for sizes 00 through 5 and to fill standard two-piece capsules and Supro sizes A through E with proper change parts and product such as beadlets, granules, flakes or powders. Last used in a healthcare industry. Includes one set of change parts. (OAD: 60" W x72"L x 64" H). Approx. Weight: 850 Lbs. Bosch Model GFK 400 automatic capsule filler rated from 50 to 400 capsules per minute – depending on materials and application. All stainless steel construction, equipped with empty bulk capsule hopper, alignment and separation sections, product hopper with agitation, fill and closing stations, filled capsule ejection and cleaning sections. Control panel with start, stop, feeder, auger and vacuum controls, with e-stop, vacuum pump, interlocking safety doors and mounted on all stainless steel base frame. Additional sizes available at additional cost.